by Assyrian Information Management (AIM). Irina Konstantinovna Gasparyan (Sagradova) was born and raised in an Assyrian family household in Yerevan, the capital of Armenia. Irina's father, Sagradov Konstantin Aleksandrovich, and her mother, Isakhanova Mariya Semenovna, are both Assyrian. Konstantin's and Mariya's ancestors came from Urmia (present-day Iran). They immigrated to Armenia in 1828. In 1937, Irina's grandfather, Konstantin had been subjected to repression and was shot. A year later, his wife succumbed to this grief and passed away. Mariya's parents lived in the Armenian village of Shagriyar until 1920, and then moved to Kiev, Ukraine. According to materials of the Kiev archive about the House of the People of the East, Mariya's father, Simeon Isakhanov, was one of the activists of the Assyrian movement in Kiev. He was abducted in a round-up during the German occupation of Kiev and was never found again. 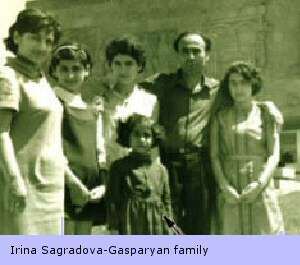 In 1943, Mariya's mother, Sonya Ishoeva, returned to Armenia with her children to the village of Koylasar (Dimitrov). Konstantin Sagradov and Mariya Isakhanov's family consists of four girls: Liza, Bella, Nelli and Irina. Irina's childhood memories had passed in Yerevan, Armenia. She studied at the Russian school, Sakharov. In 1984, Irina completed her studies at the Yerevan Polytechnic Institute. In 1997, she completed the Magister program with a red diploma. In 2000, she completed her postgraduate engineering program at the State Engineering University of Armenia (SEUA). Since 1987, she has been working at SEUA as a lecturer on the subjects of material strengths, theoretical mechanics, biomechanics, and dynamics. 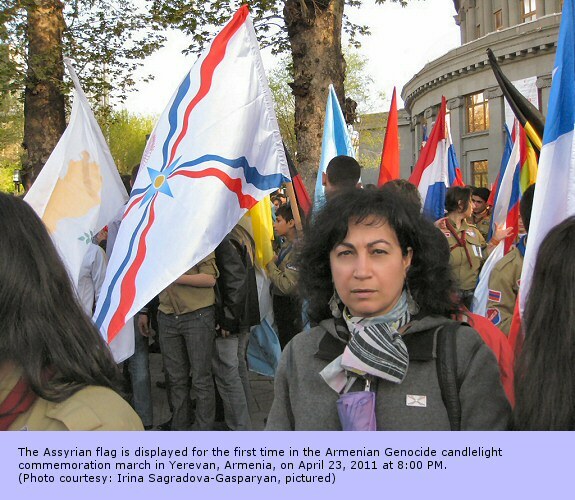 Since 1994, Irina began to be actively involved in the Assyrian community of Armenia. In 1997, she created the Assyrian youth centre, “Ashur”. In the same year and with Irina's initiative and guidance, the Assyrian language, Aramaic, had been entered into the obligatory block of studied subjects at schools within the Assyrian villages of Dimitrov (Koylasar), Verin Dvin, and Arzni. Since September 1st, 1998, one of the most prestigious schools of Yerevan, Pushkin, also opened a class with obligatory studies of the Aramaic language. Creating the textbooks in the Aramaic language. Within this framework, the concept had standardized the Assyrian language and literature, and was approved by the Ministry of Education and Science of Armenia in 2009. This standard serves as a management of obligatory studies for Assyrian teachers in schools with grades 1-12 classes. The Assyrian community is generously given an area within the Yerevan State University for Assyrian youth activities and events every year. Under the initiative of Irina Sagradova-Gasparyan, the Methodical Council of Semitic Languages program was created at the Ministry of Education and Science of Armenia, where the Assyrian language, Aramaic, is included in the program. Irina helped organize the group in order to create Assyrian textbooks for schools through the guidance of the renowned teacher and author of textbooks written in the Aramaic language, Taisa Muradova. In 2007, Irina created and is currently the president of the Federation of the Assyrian Organizations of Armenia “Khayadta” (Union of Legal Entities,) to co-coordinate the activities of the Assyrian organizations within the Republic. 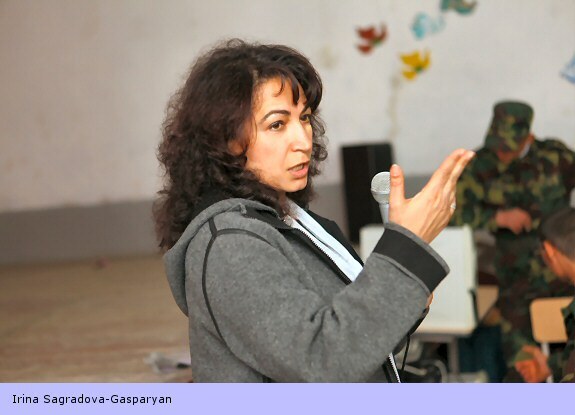 Irina continues to be an active part in the social and political life of Armenia, working passionately with human rights organizations to ensure the protection of rights of the ethnic minorities in Armenia. 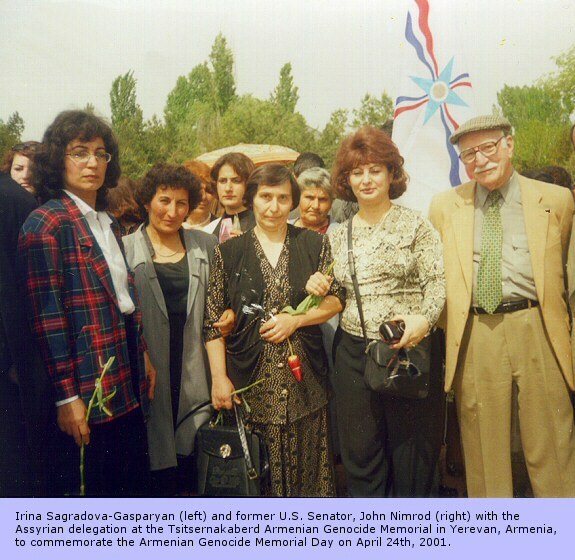 In 2000, with Irina's active participation, the Coordination Council on Affairs of National Minorities at the office of the President of Armenia, and the Union of the National Organizations of Armenia were created. 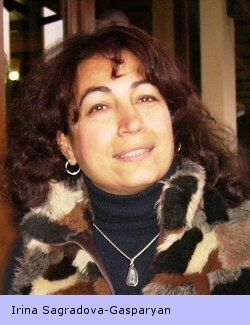 Irina was also a member of the Commission of Human Rights at the office of the President of Armenia from 1998 to 2002, and repeatedly visited Georgia as the expert on protection of the rights of national minorities. Co-operated and continues to be active with the Europe Council (EC), has been trained at the School of Leadership of EC and participated in the seminars organized by EC in Strasbourg and Budapest. Participated in the Assyrian conferences in Iran in 1999, as part of a delegation that visited our historical native land, Iraq, and in the international Assyrian conference in Moscow in 2002, where she had presented her visit report. In 2010, Irina had taken part in a conference on human measurement, Formation of the Persons belonging to National Minorities: Integration and Equality, in Vienna, Austria. As a part of the official delegation from these three representatives: Organization for Security and Co-operation in Europe (OSCE), the Ministries for Foreign Affairs of Armenia, and the Ministry of Education and Science of Armenia, Irina presented and gave recommendations as a representative of national minorities of Armenia. Her recommendations were included into the final OSCE document. Gratitude for the longstanding, productive work and the development of international cooperation in the Coordinating Council of National-cultural associations of the Republic of Armenia. In 2007, an Assyrian studio was established to create and record Assyrian music (sample) with the support of the Government of Armenia. In 2007, thanks to the financial support of the President of Armenia, Robert Kocharyan, Irina organized the Assyrian new year celebration, Akitu, with the participation of the public of Armenia in Yerevan. On this Assyrian New Year and on behalf of the President of Armenia, a salutary speech was given by the Adviser of the President. In 2009, Irina organized a youth festival with the active participation of all national minorities. The guest of honour of the festival was the Prime Minister of Armenia, Tigran Sargsyan. On December 29, 2010, the office of the President of Armenia presented an achievement award to Irina Konstantinova Gasparyan, in a festive atmosphere by Mr. Armen Abelyan, assistant to the President of Armenia. Irina's leadership continues to be a powerful voice and inspiration for the Assyrians.